Our used Auto-Sleeper Winchcombe is a long wheelbase coach-built motorhome. The Winchcombe is manufactured on a rear wheel drive Mercedes 316 Sprinter chassis with 7 speed fully automatic transmission. The engine is Mercedes’ powerful 2.2 / 163 psi turbo diesel. As is common to all Auto-Sleepers, the Winchcombe is very-much a luxury motorhome packed full of features. This Winchcombe was registered in May 2017 and is on a 17 plate; it has had just one owner from new and has covered 6,550 miles. As you would expect, it is just like new. The layout is designed for maximum comfort and space and comprises a spacious end washroom with separate shower and huge lounge with twin opposing sofas. The Winchcombe is designed as a low-profile 2 berth motorhome. Not only is the lounge very comfortable but it’s also very light with large windows, a “sky-view” over-cab window and large “Heki” roof light too. It features two comfortable, opposing sofas that convert into either 2 large single beds or a large double bed too. The kitchen space is very comprehensively equipped and features a full-size cooker with duel fuel hob (three gas rings and one electric hot-plate). It also has a tall fridge with a separate freezer above and there’s a sink, additional slide-out work surface and so, plenty of work surface. Finally, there’s an electric, domestic style extractor hood over the cooker and a dual zone micro-wave oven too. The Shower room features a fully enclosed and separate shower cubicle with integrated electric extractor, a feature sink unit and as usual, there’s also an electric flush cassette toilet with a large wardrobe and drawers provided too. Outside there’s an external gas bbq point, 230v power socket, dual-fill water system, tow bar, rear wind-down steadies, electric step, Fiamma door handle and security lock and full-length awning. Finally, our Winchcombe has beautiful Catalan Berry Belgium fabrics and classy “Valencia” finish cabinetwork with removeable carpets throughout. The cab features air conditioning, cruise control, electric windows, air bags and a colour reversing camera. This Auto-Sleeper Bourton, is a 2 Berth, 2016 registered vehicle on a 16 plate. It features both Auto-Sleeper’s Premium and Winter Packs, platinum coloured side walls with Bourton decals, “Valencia” style furniture with “Catalan Mocha” fabrics and a refillable gas tank. Our Bourton has covered only 13,678 miles and is in excellent condition both inside and out. This well cared for Bourton has a low-profile roofline and features a front lounge and end kitchen. 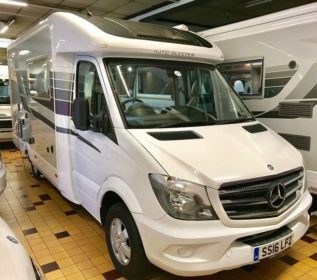 This is very-much a luxury 2 berth motorhome and Auto-Sleepers are rightly known as the UK’s oldest and leading, luxury motor home manufacturer. The Bourton, built on the Mercedes chassis features a powerful 163 BHP turbo diesel engine and a 7 speed Automatic gear-box. Both front cab-seats swivel for comfort and to face the lovely, large lounge with its twin sofas. The large and comfortable lounge also converts into either 2 singles or 1 generously large double bed at night, whilst over the cab is a large opening “Sky-View” window which provides lots of light for the living space during the day. The Bourton’s kitchen is at the rear and along-side is the corner shower-room. There is a good-sized wardrobe with handy drawer below and opposite is a 3-way fridge and a microwave housed in a beautiful cabinet. The Bourton’s kitchen is very comprehensively fitted out, featuring a full size cooker, oven and grill with electric hood too. There’s also a stainless-steel sink with hot and cold water, a glass lid over (the sink) and a paper towel holder too. Externally, our Bourton features a TV socket, a power socket and gas BBQ point too. There’s also an awning, solar panel, TV aerial, front and rear parking sensors and alloy wheels as well as a colour coded front bumper, a retractable electric step and finally, rear wind-down steadies. Finally, the cab features air conditioning, cruise control, electric windows, a DAB radio, colour reversing camera and swivelling seats with dual height adjustment as well as lumbar adjustment and arm-rests. This is a beautifully kept example of the Bourton model and is surely one of the nicest in the market place, it’s sure not to last for long !. This used Auto-Sleeper Wiltshire Duo is a long wheelbase coach-built motorhome. The Wiltshire is built on a rear wheel drive Mercedes Sprinter chassis with fully automatic transmission. Our example features Mercedes’ 2.2 / 163 psi turbo diesel engine. 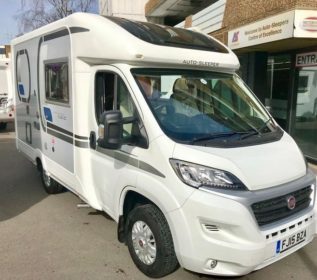 As is the case with all Auto-Sleepers, the Wiltshire Duo is very-much a luxury motorhome and is built by the UK’s leading motorhome manufacturer, Auto-Sleepers. Our Wiltshire Duo was registered in 2013, is on a 13 plate and has had just one owner from new. The layout is designed for maximum comfort and space being an end washroom, end bedroom, two or four berth, luxury coach-built motorhome. Not only is the bedroom very comfortable but the lounge is too featuring two comfortable, opposing sofas that convert into a double bed if required and it’s also completely separated from the bedroom. The bedroom features twin, domestic sized single beds with high quality memory-foam mattresses and is proper, enclosed room towards the rear of the motorhome. The separate shower room and toilet is found behind the bedroom, positioned across the rear of the van for maximum space. The kitchen is very comprehensively equipped and features a full-size cooker with duel fuel hob, three gas rings and one electric hot-plate. It also has a tall fridge with a separate freezer above and there’s a sink, additional slide-out work top and so, plenty of work surface. Finally, there’s an electric, domestic style extractor hood over the cooker and a micro-wave oven too. The Shower room is accessed from the bedroom and features a fully enclosed, separate shower cubicle with integrated electric extractor, a feature sink unit and as usual, there’s also an electric flush cassette toilet and storage locker. Outside there’s an external gas bbq point, rear wind-down steadies, a 230v socket, TV aerial, external shower point, electric step and full-length awning and roof mounted solar panel. Finally, our Wiltshire Duo has beautiful Beige and Mocha, Belgium fabrics and classy “Amarti” finish cabinetwork with removeable carpets throughout, while the cab features air conditioning, cruise control, electric windows, air bags and a colour reversing camera. 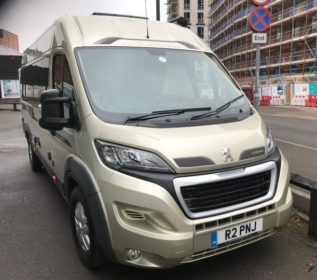 Our used Auto-Sleeper Kingham is an extra- long wheelbase van conversion, built on a Peugeot chassis and featuring their powerful 2.2 / 150 psi turbo diesel engine and six speed gear-box. 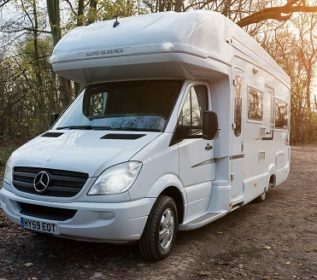 The Kingham is built by the UK’s leading motorhome manufacturer, Auto-Sleepers and is a luxury two berth, fixed bed motorhome that has been hugely popular since its launch just over three years ago. This Kingham was registered in January 2016 and has covered just 7,500 miles. It is a one owner from new motorhome and is in beautiful condition inside and out. It benefits from having Auto-Sleepers Premium and Winter packs fitted which, amongst lots of other items features cab blinds, cab air conditioning, cruise control, uprated 6kw heating, electrically heated water tank blankets, additional insulation, a large awning and alloy wheels. The cab seats swivel and there’s a single sofa behind and opposite the kitchen and sliding side door. Kinghams feature a fixed French bed to the rear with a shaped and comfortable memory-foam mattress. Along-side and in the corner is the shower room and toilet. The kitchen is very comprehensive and features a large 3-way fridge with freezer compartment. There’s also a 3-burner gas hob with oven and grill below, a sink with hot and cold water, a dual-zone micro-wave oven, overhead electric extractor and plenty of work space too. Below is cupboard and drawer storage. The Shower room, whilst compact, features a sliding sink which allows extra space to shower, a hot and cold shower and an electric flush, cassette toilet. There’s even a built-in electric extractor fan operated automatically when the light is switched on. As a later built model, our Kingham benefits from Auto-Sleepers’ dual-fill water system, low level driving lamps and refillable LPG gas. It has the more powerful 150psi engine, air-top rear suspension and has grade-3 insulation status. Finally, our Kingham is finished in Golden White metallic with Catalan Berry Belgian fabrics; woodwork is in Verada Oak finish with the cab featuring air conditioning, cruise control, electric windows, a DAB radio and colour reversing camera. This Auto-Sleeper Broadway EK TB LP 2 Berth 2015 is a one-owner example sold and serviced by us from new. It is a later model and features Auto-Sleeper’s Premium and Winter Packs, platinum coloured side walls, “Valencia” style furniture, “Moonstone Berry” Belgium fabrics and a refillable gas tank. Our Broadway has covered 20,000 miles and is lovely both inside and out. The Broadway EK TB LP is medium wheelbase, low profile and features a front lounge and end kitchen. 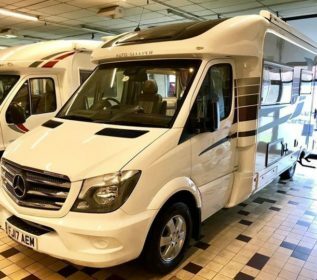 This is very-much a luxury 2 berth motorhome and Auto-Sleepers are rightly known as the UK’s oldest and leading, luxury motor home manufacturer. The Broadway range is built on Peugeot chassis’ and feature powerful 2.2 turbo diesel engines and 6 speed manual gear-boxes. Since launching back in 2009, the Broadway EK, TB, LP (end kitchen, twin bench, low profile) has always topped the new model sales charts. So, this example, being 1 owner, low mileage and so nice, is going to be very popular indeed and as Auto Sleepers haven’t been building this generation of Broadway for too long, there aren’t lots around to choose from either. Both front cab-seats swivel for comfort and to face the lovely, large lounge with its twin sofas. The large and comfortable lounge also converts into either 2 singles or 1 large double bed at night while over the cab is a large opening “Sky-View” window which provides lots of light for the living space during the day. The Broadway’s kitchen is at the rear and along-side is the corner shower-room. There is a good-sized wardrobe with handy drawer below and opposite is a 3-way fridge and a microwave housed in a beautiful cabinet. Our Broadway’s kitchen is very comprehensively fitted out, featuring a full – size cooker, oven and grill with electric hood too. There’s also a stainless-steel sink with hot and cold water, a glass lid over (the sink) and a paper towel holder too. Externally, our Broadway features a TV socket, a power socket and gas bbq point too. There’s also an awning, solar panel, TV aerial and alloy wheels as well as a colour coded front bumper, a retractable electric step and finally, rear wind-down steadies. This is a very popular model, it’s one of the nicest motorhomes for sale today, come and have a look soon. This Auto Sleeper Broadway EB, ES (END BATHROOM, EXTRA SEATING) was a specially produced, 4 berth model and features rear travel seats with 3-point seat belts and an over-cab double bed too. The EB usually features a great end bathroom and this is no different and still also has exactly the same kitchen layout and features as the standard model too; a full-sized cooker with 3 gas rings and 1 electric hot-plate, a gas grill and gas oven too. There’s even a microwave oven and large fridge with freezer compartment. The lounge, behind the cab seats features a sofa to the near-side and opposite, behind the driver’s seat, a dinette with a double, forward-facing travel seat with 3-point seat belts. The dinette converts into a double bed for sleeping. Both cab seats swivel to face the lounge and dinette while above the cab is a large, adult-sized double bed which offers the additional 2 berths or handy additional storage too. 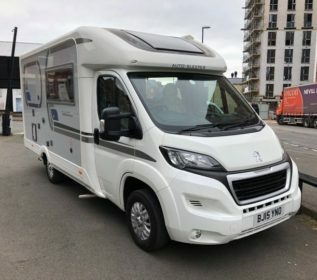 This is a very practical, luxury 4 berth motorhome, ideal for families or couples alike and has a host of standard features like a TV aerial, cab air conditioning, cruise control, electric windows and mirrors, colour reversing camera, a solar panel, a refillable LPG gas tank, blinds all around an awning and electric step. This 2015 Auto-Sleeper Nuevo EK Automatic was sold from new by us. We have just taken it back in part-exchange. 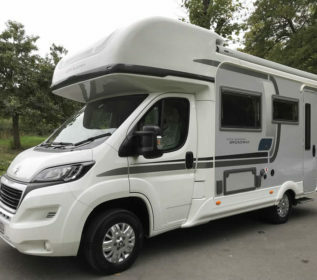 The Nuevo automatic is a short wheelbase, end kitchen coach-built motorhome and is built by Auto Sleepers, the UK’s leading luxury motor home manufacturer. As an automatic, it is manufactured using a Fiat chassis, engine and gearbox. Standard specification includes a re-fillable gas tank. The Auto-Sleepers Nuevo EK is a very popular model and an automatic version is very rare indeed. This is because Auto Sleepers have only been selling automatic versions for the last 3 years or so and the automatics are available by special order only. Our Nuevo has covered just 6800 miles and as should be expected, is absolutely lovely both inside and out. Both cab-seats swivel for added comfort and to further face the comfortable lounge area. The kitchen is to the rear with the shower room in the corner. The twin sofas are very comfortable and convert for sleeping as either singles or one good double bed. There is a useful wardrobe and drawer behind the lounge and opposite the 3-way fridge with freezer compartment. The kitchen is comprehensively fitted and features a full cooker oven and grill. There’s a large fridge with freezer compartment, a sink with hot and cold water, a dual-zone micro-wave oven and ample work space. The Shower room has a swing-wall sink unit which allows for a totally enclosed shower with a separate toilet. Outside, the Nuevo has a TV point, a gas bbq point, TV aerial, awning, alloy wheels, colour coded front bumper and a retractable electric step. Our Nuevo EK has Platinum side walls with Moonstone Mocha Belgian fabrics and “Amarti” finished cabinets. The cab features concertina blinds, air conditioning, cruise control, electric windows and a DAB radio. Finally, it has the colour reversing camera for easy reversing. This is one of the rarest motorhomes for sale in the UK today, don’t hesitate, call today. This is a 2012 Auto-Sleeper Cotswold FB ES 4 Berth. It was first registered in 2012 and has had 1 private owner from new although it was registered by the supplying dealer. It has covered 30, 550 miles. 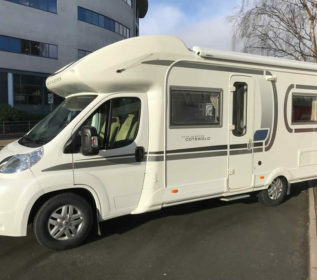 The Cotswold FB, ES is a 4-berth coach-built motorhome featuring a French bed and front dinette with seat belts for 2 additional rear passengers. This Cotswold is lovely and when produced was a very popular model as proper 4 berth/4 belt Auto-Sleepers are a rare motorhome. The dinette provides a great living space and safe travelling for passengers while the fixed rear bed is comfort personified. The side shower room features a separate shower cubicle, no soaking the whole room here and there’s an electric-flush loo and heated towel rail too. For drivers, the engine is a powerful 2.2, 130 psi turbo diesel with 6 speed manual gearbox. The cab also features air conditioning, cruise control, adjustable steering wheel, radio/cd player and electric windows and mirrors. There’s a large sky-view style window above the cab for addition light and removable carpet for convenience. Both cab seats are fitted with arm rests and are adjustable for height rake and lumbar too. Each can be swivelled around to face the lounge. The living space is great; there’s the practical dinette and sofa opposite, a fantastic kitchen with large fridge, separate freezer, full sized cooker with dual-fuel hob and a microwave too. Beyond the kitchen is the corner shower room and beside this the fixed French bed which has ample storage below which may be accessed by lifting the bed base or externally via a drop-down locker door. Finally, this Cotswold FB ES has an external BBQ point, refillable gas tank, large wind-out awning, alloy wheels, electric step and a roof mounted satellite TV system. 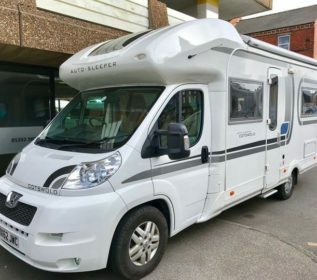 It really is a lovely 4 berth, coach-built motorhome, it is priced keenly and must be seen to fully appreciate just how good an Auto-Sleeper really is. 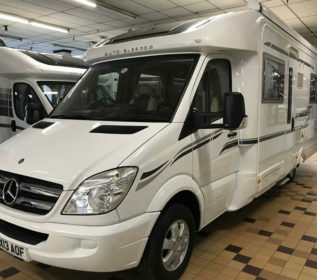 The used Auto-Sleeper Hampshire is a long wheelbase coach built motorhome built on a Mercedes chassis and features their 2.2 / 150 psi turbo diesel engine and six speed gear-box. The Hampshire is built by the UK’s leading motorhome manufacturer, Auto-Sleepers. Our Hampshire, registered in 2009, is an end lounge, two-birth, luxury coach built motorhome that features two long, comfortable lounge sofas that convert into single beds; they have a unique feature in that the beds are electrically adjustable for ultimate comfort, the head, foot and middle can all be adjusted individually at the touch of a button on the remote controls. Behind the cab seats is the kitchen and shower room; behind the driver, the spacious shower room and opposite, the large, light and very well-equipped kitchen. As mentioned, the kitchen is well equipped and features a full-size cooker with duel fuel hob – three gas rings and one electric hot-plate. There’s a fridge with freezer compartment, a sink with a large draining board, a micro-wave oven and plenty of work space. The Shower room features Auto-Sleepers “swing-wall” shower and sink unit that opens out to allow for a fully enclosed shower to be used. As usual, there’s also an electric flush cassette toilet and integrated mirrored cabinet too. Finally, our Hampshire has lovely medium Teak finish woodwork and beige fabrics. The cab features air conditioning, cruise control, electric windows and a colour reversing camera.